An Italic League that ensured peace in the peninsula for 50 years had collapsed in 1492 with the death of Lorenzo De Medici, key figure of the bloc and ruler of Florence. In 1494, Charles VIII of France invaded the Italian Peninsula and occupied the Kingdom of Naples on the ground of a dynastic claim. However, he was forced to leave the occupied territories after a northern Italian alliance won a tactical victory against him at the Battle of Fornovo. In an attempt to avoid the mistakes of his predecessor, Louis XII annexed the Duchy of Milan in the north of Italy and signed an agreement with Ferdinand of Aragon (already ruler of the two biggest Merranean islands, Sicily and Sardinia) to share the Kingdom of Naples. 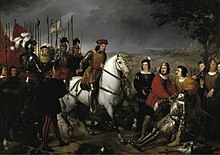 Nevertheless, Ferdinand of Aragon turned on Louis XII and expelled French forces from the South after the battles of Cerignola and Garigliano. 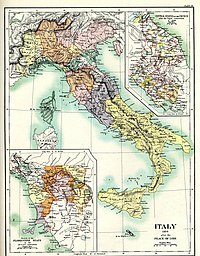 As a result of Charles VIII's expion, the regional states of Italy were shown once and for all to be both rich and comparatively weak, which sowed the seeds of the wars to come. 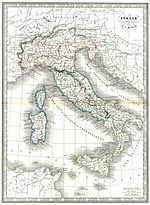 In fact, the individual Italian states could not field armies comparable to those of the great feudal monarchies of Europe in numbers and equipment. Charles V's fruitless expion to Provence distracted his attention from events in Italy. French troops operating in the Piedmont were joined by 10,000 Italian infantry and a few hundred horses on a march to Genoa. These Italian troops had been raised by Guido Rangoni, Galeotto Pico della Mirandola and other members of the military nobility of southern Lombardy. Galeotto had gained control of Mirandola in 1533 by killing his uncle Giovanni Francesco Pico della Mirandola. In preparation for his invasion of Italy, Francis I's ambassador to the Ottoman Empire, Jean de La Forêt, obtained, in early 1536, a treaty of alliance between the Ottoman Empire and France. By the end of 1536 an Ottoman fleet was poised off the coast of Genoa ready to strike in coordination with the land forces marching toward Genoa. However, when the land forces arrived before Genoa in August 1536, they found that the garrison at Genoa had recently been reinforced. Furthermore, an expected uprising among Fregoso partisans in Genoa did not materialize. So the land forces moved by Genoa and marched on into the Piedmont where they captured and occupied Carignano along with three other towns between Turin and Saluzzo: Pinerolo, Chieri and Carmagnola. The active participation of the Ottomans in the war was not significant, but their very entry into the war had a curbing effect on the actions of Charles V. Fighting a two front war, against the Ottomans in the east and the French in the west, did not appeal to Charles V. Consequently, by 1538, Charles was ready for peace. Arnold, Thomas F. The Renaissance at War. Smithsonian History of Warfare, ed by John Keegan. New York: Smithsonian Books / Collins, 2006. ISBN 0-06-089195-5. ———. European Warfare, 1494–1660. Warfare and History, ed by Jeremy Black. London: Routledge, 2002. ISBN 0-415-27532-6.